Today, we're taking a big step towards bringing more books, across more sites, to more people online. We're launching a set of free tools that allow retailers, publishers, and anyone with a web site to embed books from the Google Book Search index. We are also providing new ways for these sites to display full-text search results from Book Search, and even integrate with social features such as ratings, reviews, and readers' book collections. By providing tools that help sites connect readers with books in new and interesting ways, we hope publishers and authors will find even wider audiences for their works. What does this mean for readers? Well, since we've partnered with a number of booksellers to enable preview functionality for their sites, one way you may come across this feature is by simply shopping online for books. 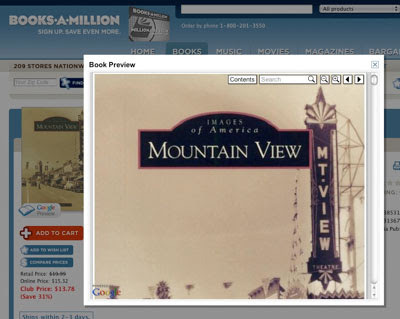 For example, suppose you've turned to the Books-A-Million site to look for a book on the history of your hometown (say, Mountain View, California). When you see a book that looks promising, you can now click on "Google Preview" to browse through the book just as you might in the physical store, without ever having to leave Books-A-Million's website. As on the Book Search site itself, you can search within the book, zoom in and out on the page, and browse up to 20% of the book. And because Google Previews are supported by the same infrastructure as Google Book Search, publishers and authors gain access to a larger distribution platform without changing the amount of the book they display to any given individual. Ultimately, we believe that these tools and partnerships further our quest to make books more discoverable on the Web, from your Google search results to your favorite bookstores, publisher and author websites, online library catalogues, and social networks. Want to learn more about the many sites now offering Book Search functionality? Check out our Who's using it page.